At Behavior Frontiers, we are always striving to offer resources and information to our families, care providers, instructors, team members and staff. We found a fantastic way to collect all the information in a convenient and visual way. 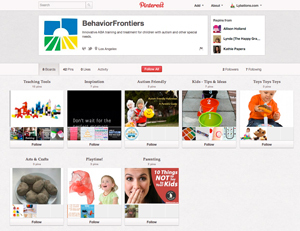 We have created a Pinterest account for Behavior Frontiers. You can review our top picks - in the way of "pins" - for everything from playtime ideas, teaching tools, parenting help and inspiration. We have encountered an endless supply of fun and fresh new ideas to spark creativity, to find that ONE perfect activity to connect with a child or to find that one word of inspiration and motivation that will get you through the day. We hope you'll join us there.